​Driverless vehicle technology is advancing at a rapid pace. Already many vehicles on the road have advanced automated driver assist features and it will not be long before highly automated and driverless vehicles become a much larger part of our national fleet. Driverless vehicles will make driving easier, allow people to be more productive and offer greater mobility to a wider range of the community than ever before. They will also help improve road safety, reduce emissions, and ease congestion. Driverless vehicles have the potential to change the very fabric and structure of our cities. Every business and every part of the community will be affected. As a result, if driverless autonomous vehicles are adopted in the right manner they will provide significant economic, environmental and social benefits. Level 1: Advanced Driver Assistance (“hands on”) - An advanced driver assistance system (ADAS) on the vehicle can sometimes assist the human driver with either steering or braking/accelerating, but not both simultaneously. Level 2: Partial Automation (“hands off”) - An advanced driver assistance system (ADAS) on the vehicle can itself actually control both steering and braking/accelerating simultaneously under some circumstances. The human driver must continue to pay full attention (“monitor the driving environment”) at all times and perform the rest of the driving task. 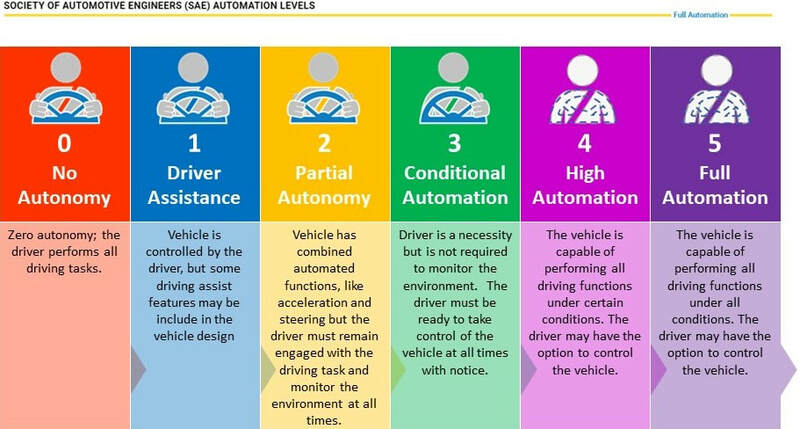 Level 3: Conditional Automation (“eyes off”) - An Automated Driving System (ADS) on the vehicle can itself perform all aspects of the driving task under some circumstances. In those circumstances, the human driver must be ready to take back control at any time when the ADS requests the human driver to do so. In all other circumstances, the human driver performs the driving task. Level 4: High Automation (“mind off”) - An Automated Driving System (ADS) on the vehicle can itself perform all driving tasks and monitor the driving environment – essentially, do all the driving – in certain circumstances. The human need not pay attention in those circumstances. Level 5: Full Automation (“body off”) - An Automated Driving System (ADS) on the vehicle can do all the driving in all circumstances even where there is no occupant in the vehicle. There is much to be done to take full advantage of the opportunity that highly and fully automated vehicles offer. Regional and urban planners and designers and infrastructure owners and managers that are both smart and innovative will look to change their approach to harness these new opportunities. But to do so they need to be well advised and they need to draw upon the type of world leading expertise in this space that only Level5design is able to provide. We are able to assist with every stage of the strategy development, planning and design process for all levels of vehicle autonomy.